Summary Wireless extender using HomePlug AV 500 powerline connection to avoid the usual 50% throughput loss. Manufacturers tell me that wireless extenders are big sellers. I suppose it's no wonder, since most everyone wishes their Wi-Fi coverage were better than it is. Most extenders, however, have one major weakness—they reduce the bandwidth of the "extended" signal by half. This is because most extenders have a single radio, which must receive, then retransmit each data packet. Twice the airtime to move each packet means half the bandwidth. Businesses use Ethernet to connect networks of multiple access points to broaden coverage to avoid this lost throughput and power APs via Power over Ethernet (PoE). But many homes aren't wired for Ethernet, which brings us full circle to why wireless extenders are so popular. TP-LINK decided to take a different approach with its TL-WPA4220KIT by using HomePlug AV 500 to connect a wall-plugged AP back to the main router to avoid the usual 50% throughput hit. The composite diagram below shows the TL-WPA4220KIT's approach vs. the way TP-LINK's more conventional TL-WA850RE 300Mbps Universal WiFi Range Extender does it. The primary advantages of the powerline connected method are more flexibility in AP placement and elimination of the 50% wireless retransmission penalty. There should also be more throughput available at the extender for it to extend. But that last advantage depends on how well the powerline signal survives all the things that work to reduce its bandwidth as it travels through your home's power wiring. 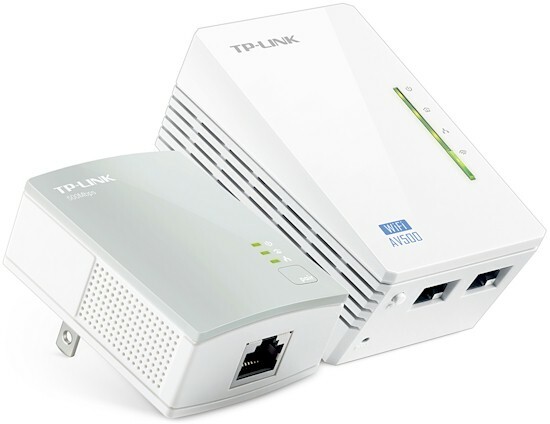 As the diagram above indicates, the TL-WPA4220KIT contains one TL-PA4010 AV500 Nano Powerline Adapter and one TL-WPA4220 N300 class Homeplug AV500 connected access point. The box also includes two 2 m Ethernet cables, printed quick installation poster and resource CD. TP-LINK tells me you'll be able to buy the TL-WPA4220 by itself and in a kit with two of them plus the TL-PA4010 within a few months. The diagram below calls out the lights and ports of the TL-WPA4220. The two Ethernet ports are 10/100 and part of a mini-switch. And here's the same for the TL-PA4010. Don't mind the Euro-style plug. U.S. kits come with U.S. style power prongs. I unsuccessfully tried prying open the TL-WPA4220 to catalog its components, but had to fall back to using the FCC ID pictures. The shot below is the front of the AP with the cover removed. Closeups included in the gallery later on reveal a Realtek RTL8196C SoC processor and RTL8192CE 2x2 802.11bgn single chip radio. The back of the board has 8 MB of RAM in the form of an Etron Tech EM638165TS-6G. There is also a small Winbond flash chip, but I couldn't make out the part number. The blue Walsin 1903A1's are 2.4 GHz antennas. As you might guess, the powerline circuitry is on second board that is sandwiched under the radio board and directly connects to the power line plug blades. That's a QCA AR7420 IEEE 1901 compliant HomePlug AV MAC/PHY in the lower left corner with an AR1540 Line Driver IC companion chip to its right. The back of this board looks like it also has a small flash device, but it was also too fuzzy in the photos to make out the part number.